As the new Occupational Safety and Health Administration (OSHA) regulation 29 CFR 1910.1200, moves industries into the Globally Harmonized System of Classification and Labelling of Chemicals (GHS), chemical manufacturers and importers will be required to provide new labels and safety data sheets (SDS). OSHA has provided deadlines for phasing in the regulation and is requiring retraining for workers on hazard communication. One key area of change under the GHS that will require training is the formatting of SDSs. – December 1, 2013 – Employers must train employees on the new labels and SDS format. – June 1, 2015 – Chemical manufacturers, importers, distributors, and employers must be in compliance with all modified provisions of the final rule, with the exception that as of December 1, 2015, distributors cannot ship containers labeled by a chemical manufactur or importer without a GHS label. – June 1, 2016 – Employers must update alternative workplace labeling and hazard communication programs as necessary, and provide additional employee training for newly identified physical or health hazards. Currently, material safety data sheets (MSDS), inform workers of the risks and safety considerations associated with the chemicals they use. MSDSs follow a variety of arrangements, but under the GHS these sheets will be known as safety data sheets (SDSs) and they will follow a strict, 16-section format. Much of the information found on GHS SDSs will be similar to what is currently presented, but formatting, section headings, and order of this information will be strictly standardized. Training sessions should focus on sections and sequence. This will help employees know what information is available and where to look for it, so they can quickly find the answers they need in the event of an emergency. The GHS stresses the importance of training all workers involved with chemicals to interpret the new SDSs so they can understand chemical risks and safety precautions. 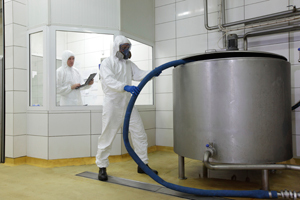 Workers involved with chemicals include: emergency responders, workers involved in chemcial manufacturing and transport, poison control staff, and agricultural pesticide users. GHS training sessions can also be used as an opportunity to provide workers with important safety information on the proper use of personal protective equipment (PPE), including safety glasses, respiratory protection, work gloves, and protective clothing when handling hazardous chemicals. Including this information will bring additional value to training sessions. Ensure workers are prepared and understand the new GHS 29 CFR 1910.1200 standard, and begin training as soon as possible. This will help protect employees, limit injuries, and maintain productivity on the worksite.